A starting point for the presentation will be Daniel’s recent article from The Letter, ‘Seminars XVII and XVIII with XXIII: On a University Discourse that might not be Joycean’. You are invited to read this article here. Daniel Bristow is an independent scholar. He is the author of Joyce and Lacan: Reading, Writing & Psychoanalysis (Routledge, 2016) and the forthcoming 2001: A Space Odyssey and Lacanian Psychoanalytic Theory (Palgrave, 2018). Raul Moncayo is a supervising analyst and founder of the San Francisco Bay Area Lacanian School of Psychoanalysis, California. He is the author of numerous books on Lacan, including, most recently, Lalangue, Sinthome, Jouissance, and Nomination: A Reading Companion and Commentary on Lacan’s Seminar XXIII on the Sinthome (Karnac, 2016), The Real Jouissance of Uncountable Numbers: The Philosophy of Science within Lacanian Psychoanalysis (with Magdalena Romanowicz; Karnac, 2015) and The Signifier Pointing at the Moon: Psychoanalysis and Zen Buddhism (Karnac, 2012). 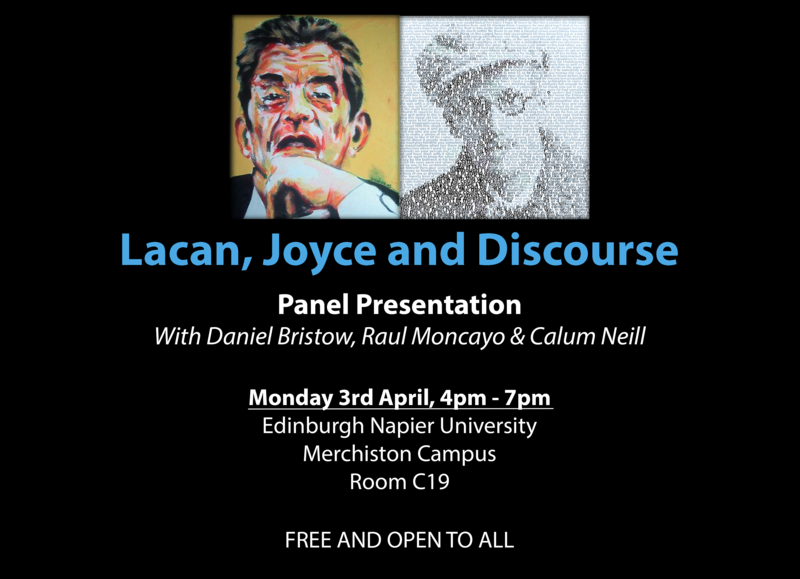 Calum Neill is a lecturer in critical psychology and discourse analysis at Edinburgh Napier University and is the author of Without Ground: Lacanian Ethics and the Assumption of Subjectivity (Palgrave, 2014) and the forthcoming Jacques Lacan: The Basics (Routledge: 2018). He is also the editor of The Palgrave Lacan Series and the co-editor of the forthcoming four volume companion to Lacan’s Écrits (Routledge, 2018).